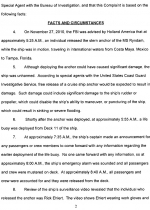 NOVEMBER 29--In the high seas equivalent of trying to open an airplane door mid-flight, an intoxicated California man early Saturday released the anchor on a Holland America cruise ship while the vessel was traveling in international waters en route to Florida, investigators allege. 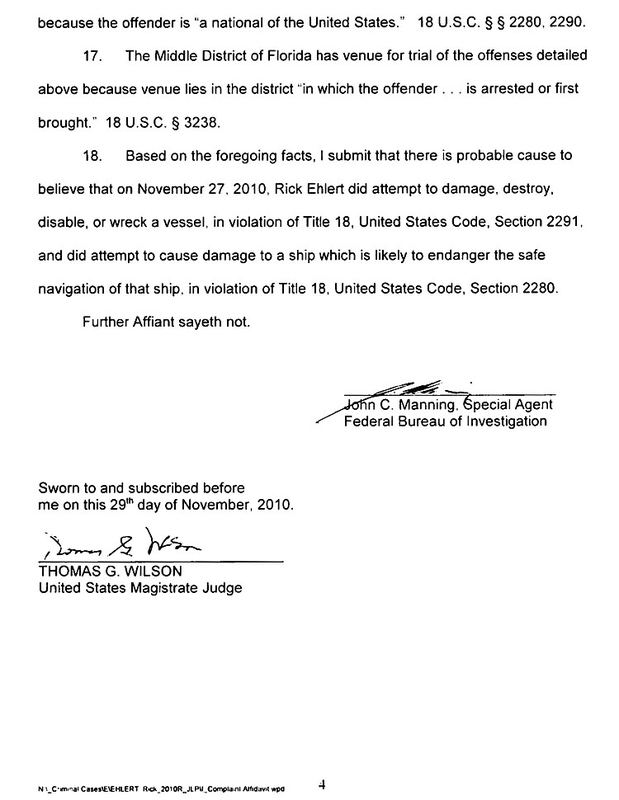 The deployment of the stern anchor on the MS Ryndam “could have caused significant damage,” though the 719-foot ship was unharmed, according to an affidavit sworn by FBI Agent John Manning. 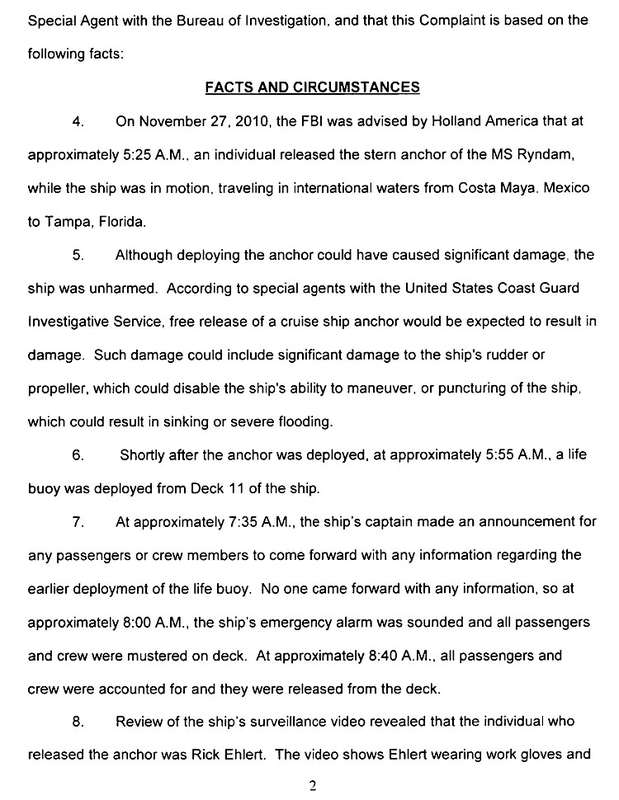 Federal agents reported that the “free release of a cruise ship anchor” could have damaged the ship’s propeller or rudder, which “could disable the ship’s ability to maneuver” or puncture the vessel, resulting in “sinking or severe flooding.” The MS Ryndam, which has a capacity of 1260 passengers and carries a crew of 580, was traveling to Tampa from Costa Maya, Mexico. A review of surveillance video identified Rick Ehlert, 44, as the passenger who released the anchor (as well as a life buoy). 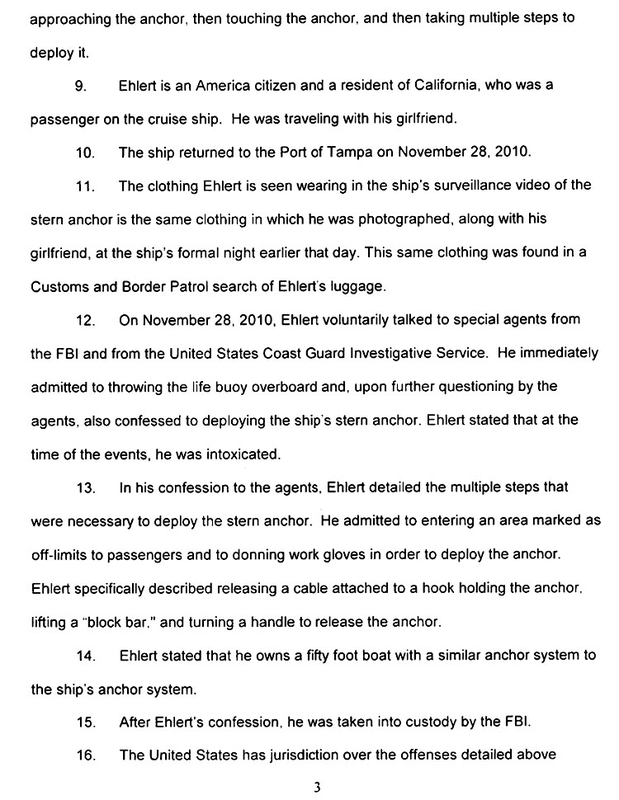 Manning noted that Ehlert was seen in the surveillance footage wearing the same clothing he was photographed in Friday while attending the ship’s formal night (for men, attire can range from a tuxedo to a jacket and tie). Ehlert is pictured in the above mug shot. Submitted by Mr. Happy on Sat, 2011-04-23 10:54. Ship's crews should be encouraged to shoot dumbazzes like this and use them for sharkbait. Submitted by Will D on Thu, 2010-12-02 12:46. Submitted by Marine Risk Manager on Wed, 2010-12-01 18:12. The reason that an anchor is not under “lock and key” - is that is the ship's emergency brake! It is deployed only in desperation (like when the are about to be in a collision) and ordering a drop anchor by the captain comes with all the risk associated with the lesser of two evils. So, offering that a “lock and key” be placed on an "emergency device" - Make you a candidate for a guest appearance on the show. Submitted by jesusjack on Tue, 2010-11-30 18:37. This a-ho is a terrorist, and he should be treated as such! Submitted by Balls of STEEL on Wed, 2010-12-22 23:55. Shut up FO There are NO terrorists. Submitted by Hamlinpiper on Tue, 2010-11-30 06:40. Submitted by MAKE MY DAY on Tue, 2010-11-30 04:16. Why was this anchor NOT under "Lock & Key" in this day and age??? Surely they have the technical expertise to stop this from happening - The cruise ship is partly to blame as well!!! Submitted by Will D on Thu, 2010-12-02 12:51. Partly to blame? Are you serious? He is responsible, he did it. Should we say that his mom is partly to blame because she never gave him the hula-hoop that he wanted when he was 11? Maybe we could blame his dad because he was never allowed to play with an anchor as a child? Maybe we should blame Jose Cuervo... Give me a break! Submitted by cactusdr on Wed, 2010-12-01 07:55. So the grocery store is partly to blame for thievery because the cereal and eggs aren't behind lock and key? Submitted by rigdriver01 on Tue, 2010-11-30 09:25. 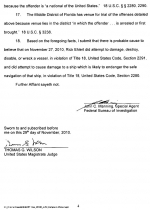 This is not a matter of "The cruise ship is to partly blame". Your parents teach you not to screw with crap that isnt yours! That should say it all. He is an idiot. Even admitted having a similar system on his 50 foot boat. So he knew not to screw with it. I drive a rig for a living and know how hard it is to stop. Can you imagine an anchor digging into the ocean floor while the boat is doing say even as little as 10 or 15 knots? The damage would be horrible. 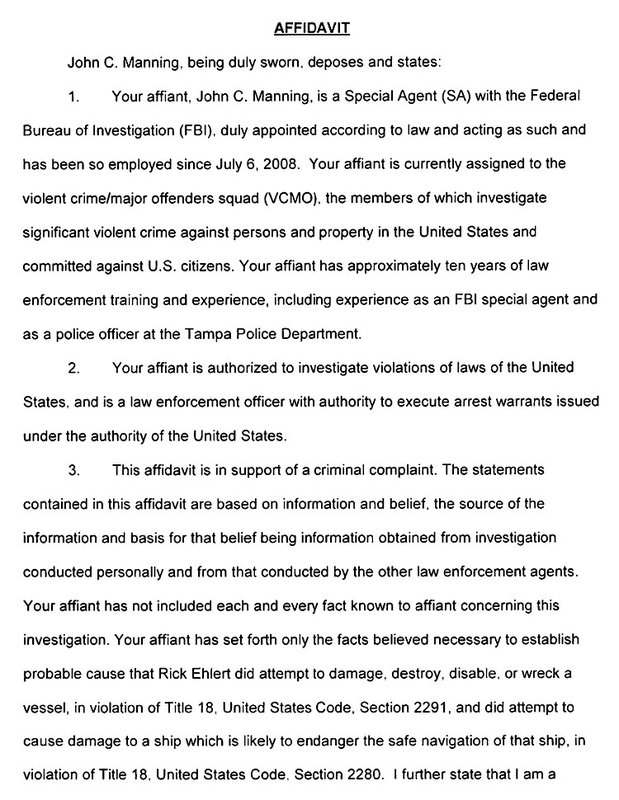 This is all on him, I hope they throw the book at him. This could have been very bad indeed. Submitted by dgt on Tue, 2010-11-30 08:04. Since it states that he entered a restricted area, donned gloves, and took several steps to deploy the anchor, this was not a case of a simple drunk stumbling on a switch and going "gee, I wonder what this does". 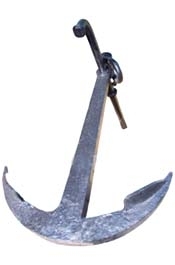 An anchor is a safety device. I don't think I would want to have to wait until someone managed to go round up the key to deploy the safety device. No, in this instance the only one to blame is the idiot who deployed it. 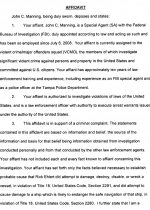 Submitted by John Steele on Mon, 2010-11-29 18:34. 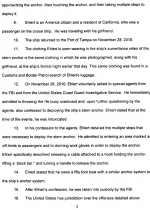 Thanks Ehlert, the TSA will take this as an excuse to implement their %$#%#$% scanners and groping for cruise passengers. Thanks a lot, now they'll $%^%^$%-up cruising too.